For emergencies and crimes in progress, call 911. The police cannot function effectively without the assistance of responsible citizens. We need your help in reporting suspicious activity. Some people fail to call because they are not aware of what is considered suspicious. Others notice suspicious activity and assume someone else will call. Still, others fail to call because they feel it may not be important enough or they are bothering the police. We encourage everyone to call police IMMEDIATELY if they feel a situation or a circumstance is suspicious. DO NOT think you are bothering the police; this is why we are here! DO NOT be embarrassed if your suspicions prove unfounded. If police question someone who has legitimate reason to be where they are, they and the neighbors will be thankful that you are watching out for them and their property – “Do unto others as you would have them do unto you”. IF IN DOUBT, CALL! It is better to err on the side of safety rather than regret having not called after an incident occurs. All are welcome to attend this informative community meeting for input and questions about crime and crime prevention matters. Meetings are held on the third Tuesday of every month at 9:30 a.m. and 6:30 p.m. at the Western District Police Headquarters, located at 389 N. Hamline Avenue, across from Super Target. There is a parking lot on the south side of the building. Neighborhood notifications about public safety and community events (SPPD): sign up to receive these notifications here. Premise Checks: A reserve officer will provide your residence with a security premise evaluation. The program is free of charge and all suggestions are left up to you to decide if you want to improve your locks, lighting, etc. There is no sales pitch or product advocacy made. The reserve officer discusses lighting, locks, security systems, windows, etc. Some insurance companies provide premium discounts to residents participating in the security audit. Call the Western District Police Department (651) 266-5485 for more information. 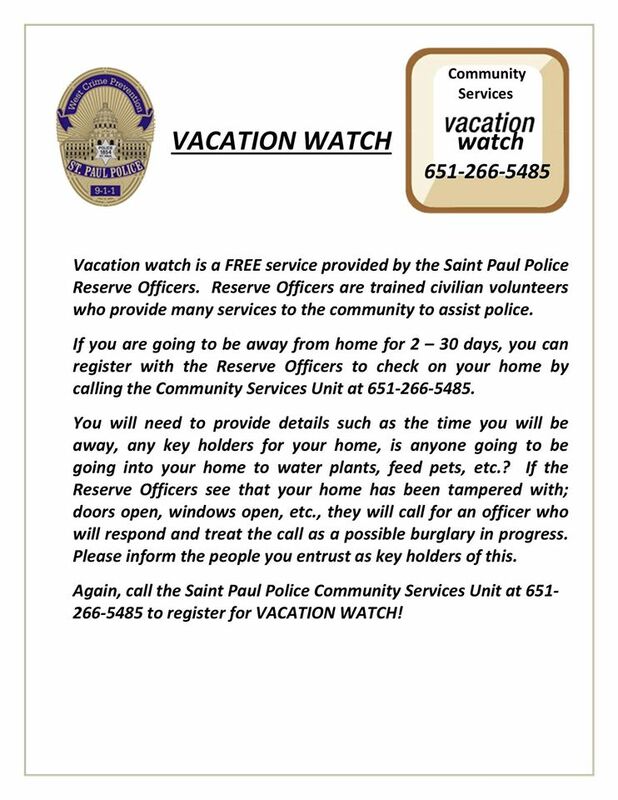 House Watch: A reserve officer, as well as police officers, will patrol by the homes of residents who are on vacation. The program is free of charge and is available for either long or short-term absences. To participate in the program residents need to call the Western, Central, or Eastern District Office. Give the dates(s) of leaving and returning. If a neighbor or someone else will be entering your home while you are away to water plants, feed the cat, etc., have them come into your home at the same time each day. This program benefits not only the resident, but also the entire block because there will be an increase of police visibility. Call the Western District Police Department (651) 266-5485 for more information. View a Vacation Watch flyer here. 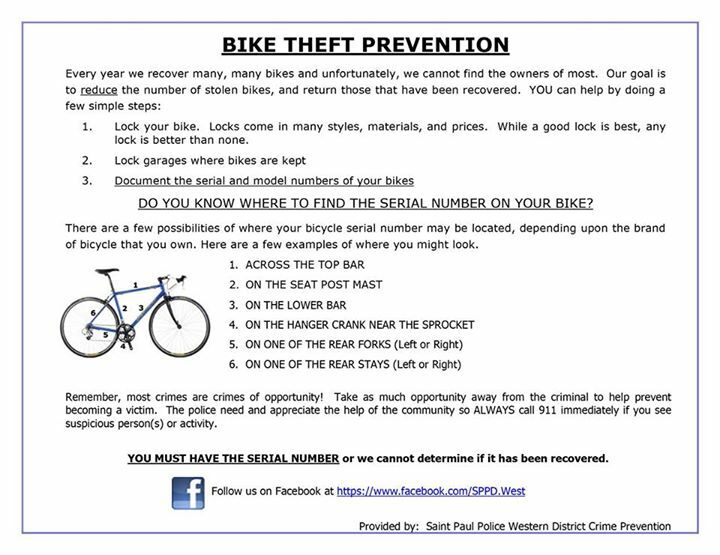 Personal Property Inventory: The Saint Paul Police Department strongly recommends that you record the serial and model number of each item of value in your home and garage. Keep a copy in a safe place other than your home, along with any pictures of the items for insurance purposes. Items that are commonly recorded include: TVs, guns, bicycles, computers, power tools, lawn mowers, watches, snow blowers, etc. Download the personal property inventory (Word doc.) to record this important information. In the event that any of these items get stolen, having the serial numbers on file will make the chance of recovery greater. Crime Victim Hotline: 612-340-5400 - A 24 hour confidential crime victim hotline that is answered by skilled and dedicated advocates 24 hours a day, 365 days a year to inform victims of their legal rights as victims and refer them to appropriate services. Consumer Affairs Alarm and Security System reviews: Click here to view. Interested in receiving email updates on crime in the neighborhood? We distribute crime notification updates which are based on news releases, tips, and information received from the St. Paul Police Department. Sign up below! Contact mgcc@macgrove.org or call 651-695-4000 for more information. Download the Neighbor Rep Handbook for more information about how to bring your block together. Learn more about registering your block for National Night Out here. 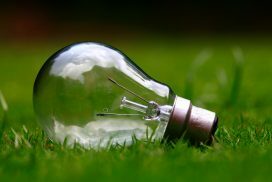 Make your block club party zero waste with these tips from the City of Saint Paul! Rent ClearStream Containers from MGCC for your block party, learn how here. A Block Club is a group of neighbors living within one or more city blocks who gather regularly to socialize, address common concerns, promote communication and improve block safety. A block club traditionally includes houses on a block facing each other but may span several blocks and may include homes across an alley. Residents can decide to organize at any level. However, there are basic aspects of a club that are necessary if they are to be recognized as such by their respective district council. Clubs may also become involved with community issues such as working with beautification, traffic calming, crime prevention, community development, and other district council activities. By being actively involved, residents take responsibility for themselves and their neighborhoods while working together to solve problems. If you're interested in identifying or starting a block club, contact mgcc@macgrove.org or call 651-695-4000.